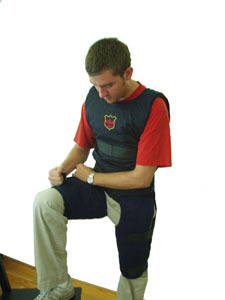 Climatech Safety’s cooling leggings are designed to be used with the HeatShield II and CM2000 cooling vests. These leggings are meant to be worn over regular pants and will double the heat protection of any cooling vest. The patent-pending body cooling clothing comes with four multi-poly phase Mylar cooling inserts. These inserts fit into the leggings to protect the lower body. Our independent testing has shown that a substantial amount of heat is absorbed through the lower body, especially when sitting or kneeling on hot floors. Our cooling leggings are an essential accessory for hot working conditions. The adjustable waist and legs ensure a perfect fit for most people. For more information on all of our body cooling products, reach out to Climatech Safety today. We understand how essential it is to stay cool during harsh working conditions and we offer a variety of products for painters, welders, sandblasters, construction workers, and more.